A while ago, I realized that my workflow would be more efficient if I had the means to cut long planks into manageable pieces. Longer planks ensure that wood graphics are consistent in the woods used in a particular furniture piece. The shorter pieces would, in turn, be processed on a jointer and thickness planer. In the case of highly figured tearout-prone woods, I would use a series of hand planes to achieve the desired board thickness.Until this time, I would crosscut large planks using a hand-held circular saw. If any precision was necessary at all, the circular saw left something to be desired. So enter the miter saw. I purchased a sliding miter saw and designed and built a stand for it. The criteria for the stand were that it be portable so I could move it around the shop if necessary. It was also important that it be designed to be folded up after use and placed along a wall. 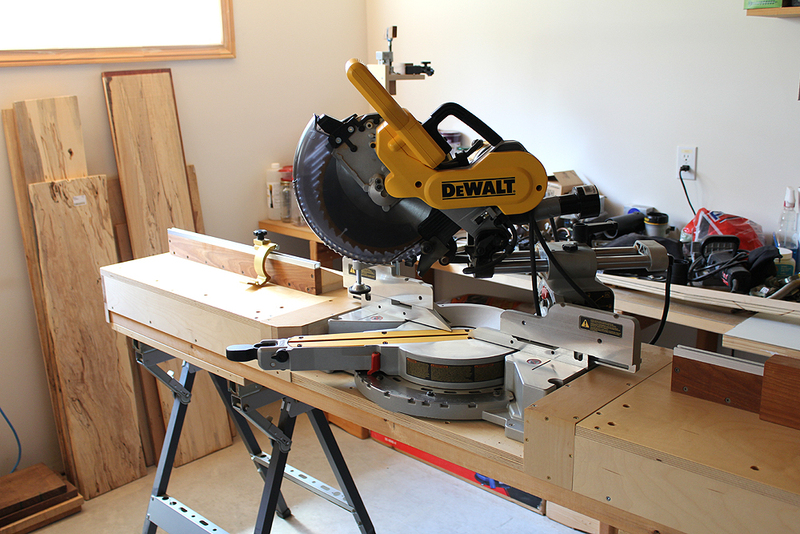 The intention was to have the miter saw available occasionally for cutting large planks down to size. I only ever work with one or two planks for a particular piece of furniture, so the miter saw could be put away between use. A few wide boards I use in my furniture can be seen against the wall at left. I designed and built this miter stand for my particular miter saw, a Dewalt 10 in. model. 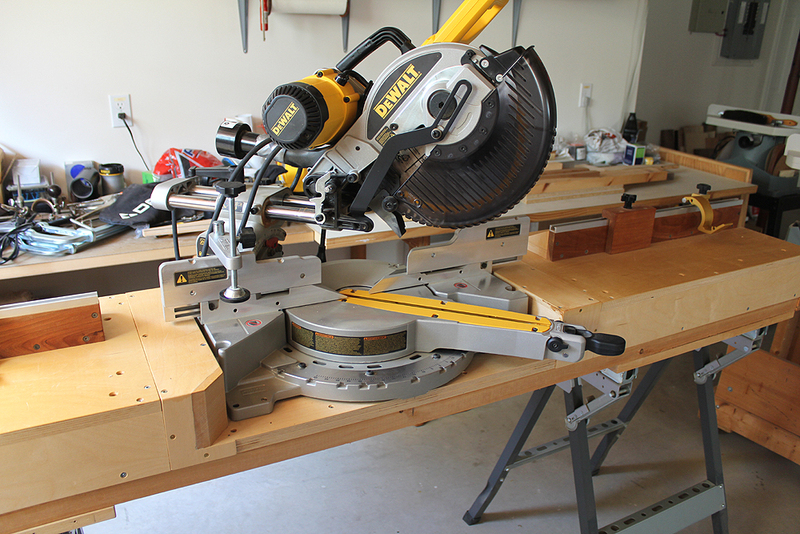 The miter saw itself can easily be detached from the stand and the table surface folded onto the metal sawhorses below. Since this would be a custom build, I could make the miter stand as long as I like. I decided on a length of over 7 feet. The left and right tables each have a fence system aligned with the miter saw fence. The largest width of planks I could process is approximately 10 inches. This is as wide as most, if not all of the planks I ever use in my work. Anything wider I can either rip an edge off or find alternative means to cross-cut it. Each fence has its own track system with both shop-made wood stops and retail metal stops. I uses the torsion box principle to build the left and right tables. Even with the utmost design in mind, it was necessary to make changes. When wide miter cuts were necessary on large wood pieces, it would be convenient to use the miter saw. This hold more true if the cuts are repeatable as when working with multiples. Swinging the saw completely to the left or right was an issue. Hence the re-designed mitered corners in both the left and right tables. I can set the saw to extreme miter angles now, greater than I would normally use in my work. So after replacing the corner of either table with hardwood cherry blocks and trimming, the mitered corners can be seen below. 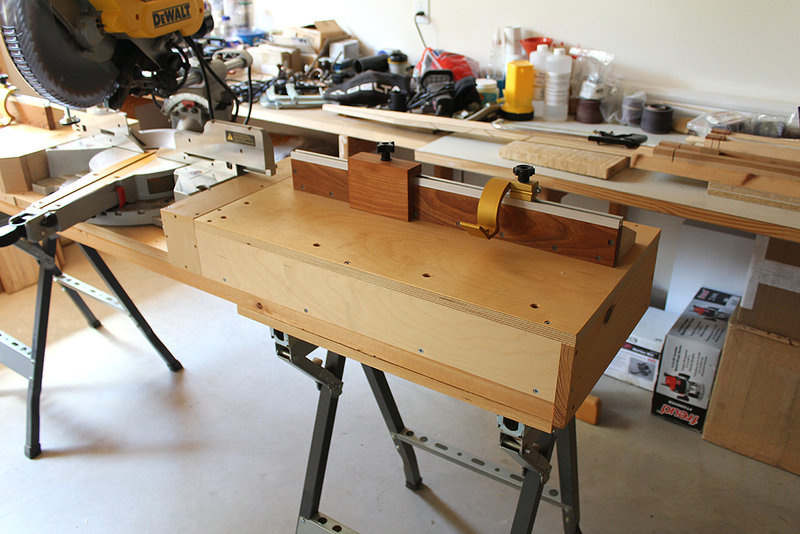 I have been using this miter saw and stand setup for a long while now. I never did fold and put it away. It is so convenient that I prefer it to remain set up. Soon after using it for the first few times, I realized dust control would be necessary. A dust port adapter was set up to connect the exhaust port to a dedicated shop vacuum. Still debating whether I need to make a dust shroud for it, but it works well as is and I like that the miter saw isn’t hidden in a shroud. Overall, a fun, exciting build and at times challenging!